If you are tired of your messy, drafty wood fireplace, you may want to consider upgrading to a convenient, easy-to-use gas fireplace insert. 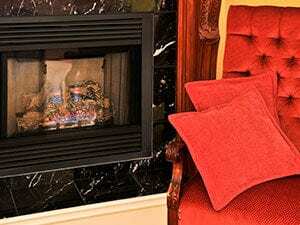 Gas inserts are designed to be retrofitted into an existing fireplace, which allows for easy and mess-free installation. With installation completed in as little as one day, Jiminy Chimney offers customers professional gas fireplace conversions at an affordable price. A gas fireplace conversion is a great way to enjoy the comforts of a warm, cozy fireplace while keeping the living space free of smoke and soot. It also greatly cuts down on conditioned air loss and energy waste and provides a convenience that wood simply can’t. Is it time you made the switch? Majestic – Majestic direct vent gas inserts feature split logs and realistic flames, and both flame and heat output can be easily controlled by remote.You’ll also enjoy efficiency levels upward of 70%, and up to 35,000 BTUs. Valor – Valor is the #1 rated insert company in North America and boasts a wide assortment of energy-efficient, clean-burning gas inserts. Whether you’re shopping for a portrait-view style or a large insert to fit with your large fireplace opening, Valor has it. Choose from traditional logs, driftwood styles, or decorative glass fire beds. Heatilator – Heatilator’s direct vent gas inserts provide large viewing areas and hand-detailed logs, making them great for those relaxing nights by the fire. Choose from an array of faces and finishes to create the perfect look for your space. Napoleon – Whether your home décor is modern or traditional, Napoleon has a gas insert that will enhance your space. Whether you’re heating 20,000 sq. ft. or 40,000, these award-winning gas inserts are sure to provide the heat output and enjoyment you long for. White Mountain Hearth – White Mountain Hearth direct vent gas inserts provide up to 80% efficiency and are designed to be controlled by remote or thermostat. These beautiful inserts can even be used as a primary heat source. If you have questions about the gas inserts we sell and install or would like to talk about your heating needs with one of our certified experts, please give us a call at 847-893-0065 or fill out our online appointment request form. We’re here to make your selection and conversion simple and affordable! Enjoy your outdoor living spaces for more of the year with the addition of a beautiful outdoor fireplace. Ask us for details on sales and installation.